ebonus.org : PAYD =>> PriPAYD (Privacy Friendly Pay-As-You-Drive) - Phoning while driving and radar detectors : ebonus is always ahead of the curve ! Talking on the phone while driving is not a new problem. But today, the accident statistics make it official : the French are learning bad habits that go against the goal of making the roads safer. Clearly, a significant educational effort is necessary in this area as well. In other words, drivers who refrain from using their mobile phones while driving should benefit from reduced insurance premiums, compared to those who don’t play by the rules. And this is exactly what ebonus Mobile Solution offers, taking this factor into account in the calculation of the insurance premium. 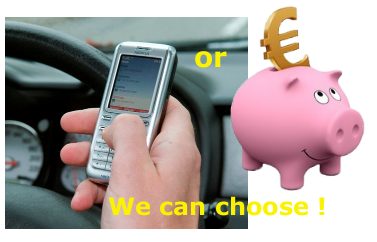 With the ebonus Mobile Solution, the more a driver uses the service while driving, the more his insurance premium is optimized, thanks to the rate of usage data that is transmitted to the insurance company. The higher the rate of usage, the greater the reduction of the premium could be. In contrast, if the driver talks (or texts) on the phone while driving, the usage rate will be reduced as a consequence of his behavior, lessening the savings on his insurance premium. As for radar detectors, the ebonus Mobile Solution is getting more buzz than ever. The idea of aggregating data onboard the vehicle (the concept behind Pripayd ebonus), which today is recommended by the CNIL (National Commission for Information Technology and Liberty), allows us to go even further in the struggle to make the roads safer. To solve the radar detector problem, which is linked to excessive speeding on the highway, ebonus offers a simple way for drivers to monitor their behavior, while still completely respecting their rights to privacy—not just at checkpoints with radar guns or speed cameras but continuously!—all while leaving each driver a margin of error (statistical analysis).